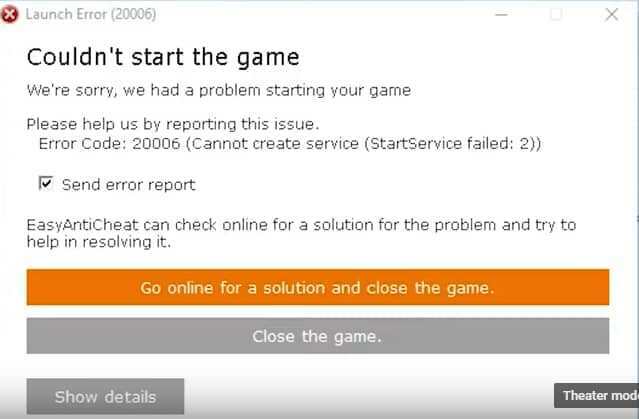 If you’re getting the following error: “Couldn’t start the game. Fortnite Error code: 20006 Cannot Create service (EasyAntiCheat)“, you’re having some difficulty with the EasyAntiCheat service. We’re seeing this error with Fortnite, Rust, Smite, Paladins, Wildlands, Rising Storm, Far Cry, For Honor and any game that requires the EasyAntiCheat service. We’ve gathered some fixes for this EasyAntiCheat (EAC) initiation problem below. According to their website, Easy™ Anti-Cheat is an anti–cheating service that counteracts cheating and hacking in multiplayer PC games. It uses “hybrid anti–cheat mechanisms” to accomplish this. It works by employing both client and server–side analysis to quickly recognize different threats and hacking techniques. A verified fix in Reddit reference the above YouTube video from Zuhma. He promises a quick tutorial to fix the Fortnight EasyAntiCheat error that occurs when you open up the game. He’ll walk you through accessing your file explorer, navigating to your main hard drive, locating Epic Games, and using a Windows Repair option on the EasyAntiCheat setup.exe file. One solution came from a user who said that the reason for the error was because the Easy Anti Cheat folder was located outside his Forntnite folder. So he relocated the EAC folder inside C:\Program Files (x86)\Epic Games\Launcher\Engine\Binaries\Win64. Than he opened EasyAntiCheat.exe and uninstalled and reinstalled the program and the game ran. Another fix comes from a Reddit user who said that he cleared the error by going to C:/Windows/system32/drivers and deleting/moving/renaming the EasyAntiCheat.sys file. Then he restarted Fortnite and it worked flawlessly. He also suggested doing a logout/login after the fix to complete the process. 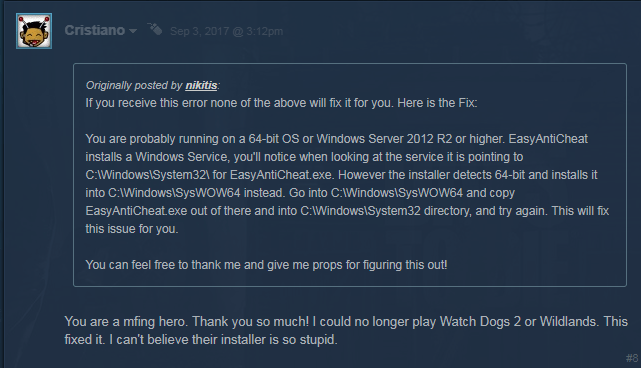 EasyAntiCheat, as recommended by the Steam community, has some generic, but workable, fixes for the “Failed To Start The Game (CreateService / StartService / WriteFile)” error- it’s worth going through some of their solutions. They say that these error messages occur whenever the game launcher isn’t able to initiate the EasyAntiCheat service when it is required to launch the game. The error message will include the System Error Code of Windows inside of the brackets. The YouTuber Everthingy provides another fix by accessing your Fortnite folder or the game directory in question- watch the video for the full fix. There you go- 6 solutions to this EasyAntiCheat, Error code: 20006 problem. Let us know in the comments if any of these did the trick.